A tasty alternative to a classic parfait. In a large sauté pan over medium heat, toast oats until light brown, about 3 minutes. Allow to cool. Using a mixer, beat whipping cream until stiff peaks form. In a medium bowl, whisk together sour cream, honey and Irish cream. Gently fold half of the toasted oats and the sour cream mixture into the whipped cream. To assemble: Place half a cup of oat cream in each glass, layer with 2 tablespoons of toasted oats, then 2 tablespoons of raspberries. Repeat the layers. 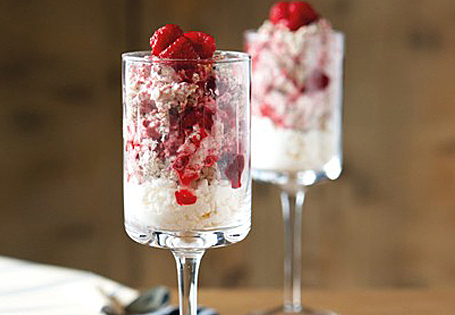 Top each parfait with 2 tablespoons of raspberries.